Are you having problems with bad pin orientation? PROBLEM: Many of the problems that cause bad pin orientation are caused because the turning pins on the orientation pan are not fixed! Because they are not fixed, as the distributor moves from bin to bin; the turning pins move closer or farther from the pin wheel causing erratic orientation. 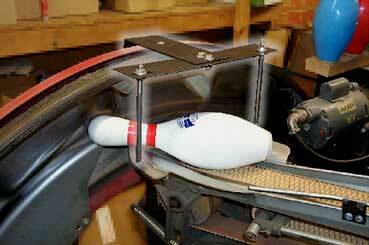 REMEDY: We have solved this problem with the new "Tuffy" Pin Orientator. The Orientaiton of the pins is now done by fixed turning pins. With the new "Tuffy' Pin Orientator pins are turned on the pan the same way every time! NOTE: We suggest that you remove turning pins on your orientation pan, but for the most part will work alright if left on. Installation time: 15 minutes or less. Call for more information or order a video of the "Tuffy" Pin Orientator and see it in action.